After a decent sized pullback since the Fed meeting last Thursday, just 16% of S&P 500 stocks remain above their 50-day moving averages. The 50-day moving average is typically seen as a dividing line for short-term directional trends. Stocks above their 50-days are uptrending, or at least not downtrending. Stocks below their 50-days are downtrending, or at least not uptrending. 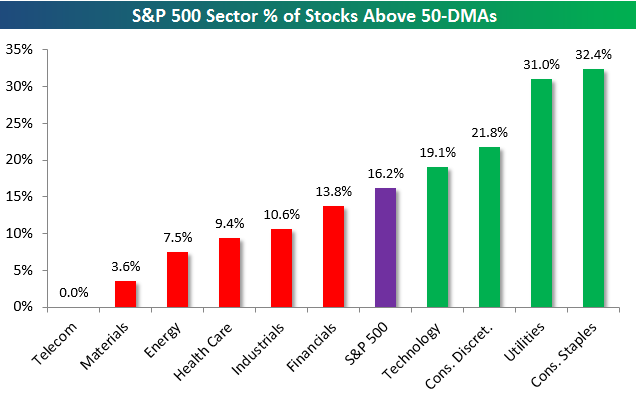 In terms of sectors, two defensives have the highest percentage of stocks above their 50-days, which is expected in a down market, but not what bulls want to see. The Consumer Discretionary sector has just barely over 20% of stocks above their 50-days, while Technology’s reading stands at 19.1%. Health Care, Energy, Materials and Telecom all have readings under 10%. Not good. 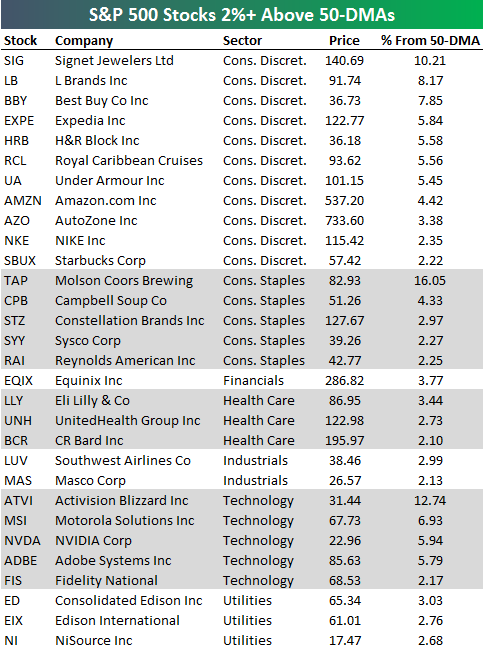 Just 6% of stocks in the S&P 500 are trading more than 2% above their 50-days right now. Below is a look at this dwindling list, sorted by sector. A few notables include Amazon.com (AMZN), Nike (NKE), Starbucks (SBUX), Under Armour (UA), Campbell Soup (CPB), UnitedHealth (UNH), Southwest Airlines (LUV), and Adobe (ADBE). Want more from Bespoke? Start a 5-day free Bespoke Premium trial today.